Matt is a California native (yes, they do exist) whose face should be familiar to anyone who watches a lot of television. After a lucrative career as a contractor, Matt decided to pursue his real dream: acting. That decision proved to be a wise one, as he immediately began getting roles in commercials and features. These roles were usually authority type characters like CIA, FBI, cops, detectives and military, so it’s perhaps no coincidence that he was cast as an ex-Forest Ranger in Primeval. Matt has an easy-going charisma that translates well to the screen and really adds dimension to the “tough-guy hero” character he plays here. Check out Matt's web site here. "Amy Shelton-White brilliantly plays Nicole, a woman struggling with intense feelings of loneliness, sexual frustration and abandonment. Every movement has subtext, every event reveals more of her inner workings. By the end of the film we know Nicole more deeply then we know many of our own friends. The way I felt when the film ended is the exact way I felt walking out of such films as Requiem for a Dream, Welcome to the Dollhouse, and most notably, Baise Moi. Amy Shelton-White and director Ian Gamazon have introduced me to a character I think I will never forget. And love it or hate it, you will not be able to forget her either. She is distinctively real and believable and Amy Shelton-White never shows her seams. From start to finish she is Nicole." In addition to her feature film work, Amy is a member and co-founder of 9 Layer Dipz, a popular comedy troupe that performs weekly in Hollywood. The role of “Helen” in Primeval offered Amy something new, however. Helen is a strong character, extremely smart, charismatic, and definitely not the “damsel-in-distress” type. To bring the character to life, Amy was able to draw upon her own fascinating background. For example, she lived in Tanzania for nearly a year, teaching English as a second language, climbed Mt. Kilimanjaro, and witnessed the migration of wildebeest across the Serengheti Plains. While the role of Helen seems like it was written just for Amy, that wasn’t the case, it was simply a matter of good luck. Gary studied acting while in his early twenties and actually landed a role at his first audition (White Cargo). He went on to a busy career in regional theater, playing lead roles in such productions as Inherit the Wind, The Big Knife, Desire Under the Elms, and Bus Stop. This lead him to directing, and he directed several plays, a television pilot (Fight For Fame), and an independent feature (The Casualty). His recent work includes several national commercials, including Northwest Airlines, Dunkin’ Donuts, and McDonalds. The role of Dr. Ethan Edwards suits Gary perfectly: in addition to his acting career, Gary is a college professor just like Ethan. You can't ask for a better actor/character match than that! Kevin hails from the Twin Cities of St. Paul-Minneapolis where he studied acting at the famous Guthrie Theater. Since arriving in Los Angeles in 2001, he’s amassed a credit list of more than twenty projects, running the gamut from features to commercials to television. For Primeval, his military background proved to be extremely valuable. 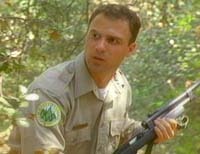 As “Chief Forest Ranger” he really took charge of his “team,” adding an extra bit or realism to both the character and the film as a whole. Three-time Emmy nominee David Zelina arrived from Cincinnati only five months ago (by way of a short stay in New York too) and has already started making a name for himself. He recently completed a two month run in Antigone at the Knightsbridge Theatre-LA and appeared in the independent feature film Welcome To Palm Gardens. In addition to his acting skills, David is a trained stuntman, having been trained by The Society of American Fight Directors (SAFD). He’s an award-winning swordfighter and has choreographed fights for several plays. In Primeval, David choreographed and performed his own stunts, including an amazing running fall down a ravine where he had to roll to a stop precisely at his mark, with only half an inch of leeway. He nailed it on the first take, as he did each of his other stunts. The role of Brian Stratton turned out to be perfect for David—so much so that the part was enlarged after the first day of shooting, when the chemistry between him and Stacey Branscombe (as Janet Combs) became evident. Together they make a wonderful comedy team and are already discussing a future project. to be missed" role of Loretta in George F. Walker's Featuring Loretta. Juliana also filmed four feature films this past year and is already in pre-production for her next project "Art Imitating Life" in which she plays a lounge-singing muse with a questionable past. The role of Lou in Primeval is an unusual one for a beautiful girl like Juliana—a smart college student without any hint of silliness or air-headedness—and she pulled it off perfectly. Click here for Juliana's web site. Stacey is a rarity in Hollywood: arriving only nine months ago after training in New York, she has been constantly working in film & television and has not had the opportunity to partake in the usual “restaurant training” that most actors go through. Primeval marks Stacey’s third independent feature film role, and the part of “Janet” is guaranteed to be one of the film’s most memorable. Stacey’s wonderful take on the character is what secured the role for her: from the first minute of her audition, she was Janet. Rick managed to squeeze time to star in Primeval into his busy schedule from General Hospital, where he has a recurring role as “Marco.” Prior to that, he appeared in HBO’s acclaimed, Emmy-nominated, Path To War, the story of the U.S. involvement in Viet Nam, and FOX’s As-If. 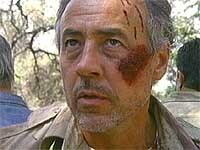 Primeval is Rick’s third feature film. Having trained with the world-famous Second City, The Groundlings and The Actors Lab, Paul was a natural choice for "Taylor," one third of the comic team that opens Primeval. And in addition to acting in films, Paul is an accomplished filmmaker, having written, directed and starred in the award-winning short films, Pastry Puffs and Zero Minutes Remaining. He's also won several editing awards. And somehow he's found time to be a member (along with his Primeval co-Star, Amy Shelton-White) of 9 Layer Dipz, a popular comedy troupe that performs weekly in Hollywood.